I found this image on tumblr. Cool, isn’t it? 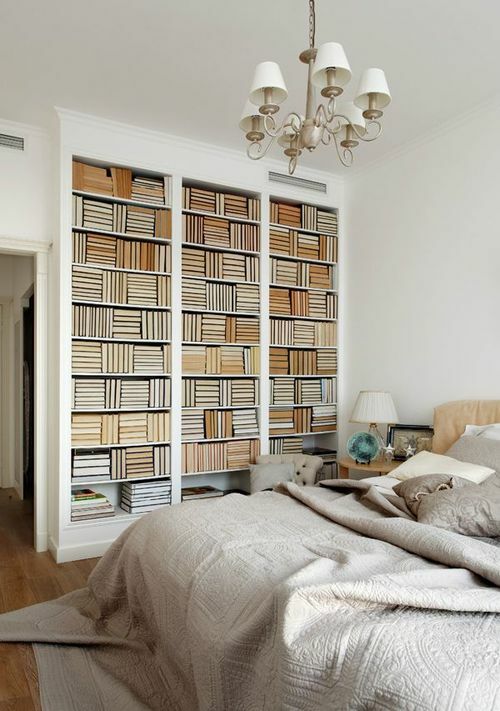 I would never have thought to turn books backwards on the shelves but the design is so wonderfully graphic… although you would have a really hard time finding the book you want :-). This would also be a fun, and easy, idea for a pieced quilt! This entry was posted in Design, Quilt Related and tagged design, inspiration by Becky Goldsmith. Bookmark the permalink. Have you seen the bookshelf art created using book covers? Check out this video: http://www.cbsnews.com/videos/bespoke-libraries-bring-books-and-design-in-harmony/ or Google Thatcher Wine, the creator. Amazing! Watching it now… that is pretty cool! He’s from my home town! Kind of interesting, but I’m mostly interested in reading my books & I want to be able to recognize them at a glance! Very graphic if not very practical for those of us who read and reference our books. The older I get the more I think people don’t use their books. What IS the future of physical books now that we’re reading them digitally – no more books in the house! No bookshelves in homes in the future? Hard to imagine.